Can our days of losing lens caps finally be over? One company certainly seems to think so. The people behind the Universal Lens Cap Kickstarter campaign are promising a secure, one-size-fits-all lens cap that will never grow loose and fall off. The silicone-based lens cap works by wrapping around the front of your lens – you simply pull it over like you would a rain hood. It’s claimed to be waterproof, dirt-proof, shock-absorbent and eminently portable, with a malleable shape that allows it to fit into any space in your bag. Claimed to fit every lens, it stretches between 60mm and 150mm provides a "zip-locked" hold that also protects your lens from internal moisture due to changes in humidity. The makers, Kuvrd (as in ‘covered’ – get it? ), claim the cap's shock-absorbent properties should protect lenses from various smacks and bangs that a standard lens cap would fail to guard against. It can be used as a front or rear cap, and is also stackable, which means you can simply wrap two of the caps on top of each other if you're worried and want some extra security. 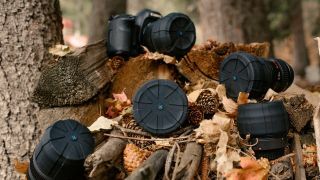 Kuvrd claim to have spent a year working with professional photographers and videographers in order to perfect the design of the Universal Lens Cap, and are said to have gone through six different moulds and two different patents before taking the cap to Kickstarter. The Universal Lens Cap has blown past its $2500 goal on Kickstarter, making almost US$80,000 in pledges at time of writing. Want to secure one yourself? Simply head over to Kickstarter. You'll need to pledge at least $30 to secure a cap, but if you also share your pledge on social media, the makers promise to throw in another for no extra cost (effectively pricing the caps at $15 each). The producers expect to be shipping the caps after March 2018, and the Kickstarter campaign will be running until January 15th.